You plan to lug around this car seat in and out of the car a lot so you need something light that won’t kill your back. You have one child or children and another on the way and God have mercy on you because you know that you will need extra 5 arms to hold onto everyone and everything. You want a car seat that won’t drain all of your remaining strength. You plan to travel and to take your car seat with you on vacation. The idea of lugging another heavy item (besides your luggage and child) does not seem appealing at all. You just basically want to make your life easier. Life is hard enough as it is with a child. Lightweight seats are heaven-sent. If any of the above reasons apply, we totally understand. Bearing in mind that the average car seat weighs anything between 20 to 25 pounds, you are being smart if you are thinking about car seat options. There are also backless booster seats but these are for older children who are ready to use the adult seat belt and merely need a seat to boost them higher up. These backless booster seats are not really classified as ‘car seats’ and are a lot lighter than a traditional car seat because they don’t have a back. An infant car seat is one that is used for babies between 0-12 months. A convertible car seat is one that normally does at least two functions out of the following three; rear-facing, front-facing, and booster. An all-in-one car seat does all three functions; everything from rear-facing to booster. Typically, an infant car seat weighs less than a convertible car seat and an all-in-one car seat weighs more than a convertible car seat. In other words, the more that the car seat does, the more it also tends to weigh. Also, car seats designed for older children tend to be heavier because older children can climb in and out of the car themselves and there is no real need to take the car seat out. Most manufacturers don’t expect parents to take the car seat out once it has been installed in the vehicle. This is unlike infants who are often carried in and out of the car in their car seats because they can’t sit up, crawl or walk or tend to be sleeping all the time. You really don’t want to wake a sleeping baby! It has been mentioned in parent circles that you should try and bring your own car seat when you go on vacation. Why? If you plan on renting a car, car rental companies often charge an arm and a leg for car seat rentals. On top of this, many parents complain that car seats rented out by car rental companies are often old and not well-maintained. You have no information on the history of the car seat, how often it has been used and whether it has been looked after by other users. In addition, the car rental company will not tell (or care to tell you) if the car seat has been involved in an accident, which compromises the safety of the car seats. Some rental companies also don’t provide any guidance for installation of the car seat, which is extremely important when a study revealed that approximately 70% of parents of a newborn positioned their infant or installed the car seat incorrectly. Taxis often don’t provide car seats and if they did, the same problems mentioned above seem to come up a lot. Another huge factor to consider is the flight that you are going to be taking itself if you are going to be travelling by air. In a nutshell, your child is going to be safer restrained in a car seat, rather than sitting on your lap. According to the FAA, children up to 2 years old may be allowed to travel on a parents lap but they strongly recommend that children be seated in a car seat. During a turbulence or major flight incident, being in a car seat with a proper harness is going to keep your child a lot more secure, as well as comfortable. Not to mention that you will be glad that you don’t have to hold your child in your arms for the entire flight! For children over 40 pounds or over the age of 2 years, it is acceptable for your child to use the plane’s ordinary safety belt but you may still prefer to bring along your car seat onto the flight instead of checking in the car seat at the gate as some parents report that they find their car seats damaged after being checked in. Some parents come up with the idea of buying a used car seat to take with them on vacation. This is in case their car seat gets trashed while on vacation. Just like the renting of a car seat from a car rental company, you often don’t know the history or the way the car seat has been treated if it’s secondhand or used. You should not use car seats that have been involved in an accident (even minor accidents) as the safety of the car seat could be compromised. Secondhand car seats may be missing important parts that you are not aware of and often don’t come with the original manual and instructions for installation. Secondhand car seats could have reached its manufacturing expiry date and is no longer safe to use. Secondhand car seats could have been recalled for design or safety flaws. Instead of risking your child’s safety by buying a used car seat, you could look for a reliable but budget lightweight car seat. We have some fantastic recommendations below. Total weight of the car seat- is it light compared to other car seats? 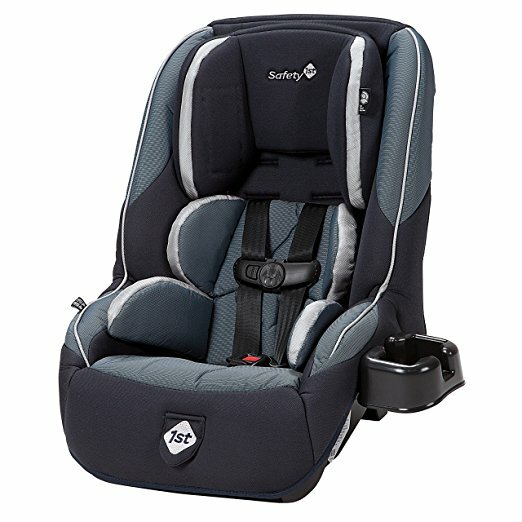 Dimensions of the car seat- is it bulky? If you plan on taking this car seat onto the plane instead of checking it in at the gate, is this car seat approved by the airline company? In the US, the car seat must be approved by the Federal Aviation Administration (FAA). An FAA approved car seat will have this label in red or on a sticker at the bottom or side of the car seat that says, “This child restraint system conforms to all applicable Federal Motor Vehicle Safety Standards” and “This restraint is certified for use in motor vehicles and aircraft.” In general, a car seat should be no wider than 16 inches to fit in a plane’s seat. If you are purchasing a car seat outside of the US, check with your local airline to find out which car seats are approved for use on the flight. If you bring an unapproved one, the airline will most likely ask you to remove your car seat and to check it in as an additional check-in luggage. Ease of installation and dismantling- can you easily install it on-the-go? Ease of use- is it easy for you to use? Ease of cleaning- can your just pop the seat pad into a washing machine? Is it safe- does it have safety features such as side-impact protection, LATCH, and the 5 harness system? Height and weight range suitability- is your child going to fit in it comfortably? Expiry date- you want a long expiry date. Is it comfortable? Will your child like sitting/sleeping in it? Is it going to be good value-for-money or costly? Bearing these factors in mind, here are our top suggestions for lightweight seats that are also parent-approved. If you are looking for a super light car seat at a great price, this is the one to get. Yes, this is a Cosco car seat but don’t panic. You don’t have to be a member of Cosco to qualify to buy this Cosco car seat. It is actually available on Amazon! The great thing about this car seat is that it comes highly recommended by moms and is FAA approved. It is super duper light at only 7.65 pounds and is such a pleasure to carry around. The installation process is relatively easy and it can be quickly installed on a flight or car. In terms of size, this car seat’s dimensions are 22 x 17 x 23.5 inches so it’s not too bulky. It can be used rear-facing for children who weigh between 5 to 40 pounds and between 19 to 40 inches. It can also be used forward-facing for children aged 2 and above and weighing between 22 to 40 pounds and 29 to 43 inches. This car seat comes with the LATCH system, 5 harness heights, and 3 buckle locations. Once the car seat gets dirty, just pop the seat pad into your washing machine for quick cleaning. It is also suitable to be put in the dryer. Although this car seat is one of the best lightweight baby car seats around in our opinion, there are some downsides too. For example, this car seat doesn’t come with thick padding like some other car seats do but at the great price of this car seat, we don’t think that you will mind. Our second recommendation is the Safety 1st Car Seat. This is the car seat to get if space is equally or more important for you. This car seat is great for fitting in tight spots. The product dimensions of this car seat are 30 x 18 x 14 inches. This makes this car seat pretty narrow, which is wonderful if you are trying to fit the car seat in a tight space like an airline seat; or if you don’t want to store a bulky car seat while on vacation. This car seat also works perfectly if you have a big family with several young children who all need to be in car seats. You can actually fit 3 of these car seats together across your back seat! This car seat allows for rear-facing with children between the weight of 5-40 pounds and forward-facing between 22-65 pounds. This means that you can use this car seat for longer, compared to the Cosco Scenera NEXT which can’t be used by children weighing more than 40 lbs. The car seat itself weighs 15 pounds, which is not as light as the Cosco Scenera NEXT but still pretty light compared to most other car seats. The car seat has a 5 point harness system, 5 harness heights, 3 buckle locations and anti-rebound bolsters for safety. This car seat also comes with an adjustable headrest with side impact protection with energy absorbing foam. It also comes with a removable cup holder. The seat pad is also washable. This car seat looks nicer and is a little more comfortable than the Cosco Scenera NEXT but just be aware that its price is also a little more expensive. If your child is nearing or weighs more than 40 lbs, get the Safety 1st Guide 65 Sports Convertible Car Seat. 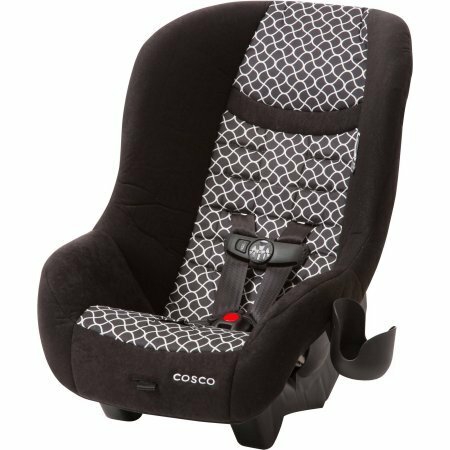 If weight is the most important factor for you, get the Cosco Scenera NEXT Convertible Car Seat. If space-saving is the most important factor for you, get the Safety 1st Guide 65 Sports Convertible Car Seat.